Need a basic carpet cleaning chemical for your carpets? We have several to choose from, as well as a carpet deodorizer to help your carpets smell fresh and clean after you extract the dirt. You'll find tough traffic lane cleaners as well as encapsulation cleaners, here in this general carpet spotters section. Adding a defoamer to the recovery tank of your carpet extractor is an absolute must! If a defoamer is not used the foam in the recovery tank will likely be sucked through the vacuum motor of your extractor machine. This is a bad thing. It will cause the motor to fail much sooner than with normal use of a defoamer. Enzymatic cleaners are a special class of carpet cleaners. They use very effective enzymatic action to break up soil, dirt, stains, and spots in your carpet and upholstery. 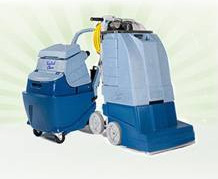 This tend to be a gentler way to treat you carpeting than to use a tough chemical cleaner with a very high or low pH. Enzymatic cleaners are also great for removing/eliminating pet accident odors, not just masking them. Have some significant cleaning jobs to take care of? Having a diverse arsenal of cleaning chemicals, or a spotter kit, will let you tackle any carpet cleaning job without having to re-order something special and wait for its arrival. 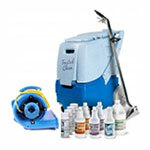 Have everything on hand that you'll need for all your carpet cleaning jobs. One of our carpet cleaning package deals may be just what you're looking for without having to order everything separately. Sometimes you have just a small area of carpeting or upholstery that you need to treat. Enter our spot and stain cleaners. If you know what substance made your stain in the first place you can then pick the appropriate spotter chemical to counteract it. Read the description on our spotters to find just the right one. please give us a call at 888-722-5508 (M-F 8am - 5pm CST). Which Carpet Extractor Is Right For You? Carpet extractors, carpet cleaning machines, and carpet spotters are fabulous machines to help you get your carpeting and upholstery really clean. If you have ground-in dirt and soiling than a carpet extractor will help you get that dirt and stain out more thoroughly. How do they work? By injecting water and cleaning solution into your carpeting you get to clean much deeper than just vacuuming the surface. Some of our carpet machines have a built in scrubbing brush, like our self-contained carpet extractors, to agitate the dirt to lift it out more easily. Our hot water and cold water carpet extractors are used with a carpet wand or hand held upholstery tool, usually without a brush, to extract the dirt out of your carpet or upholstery.